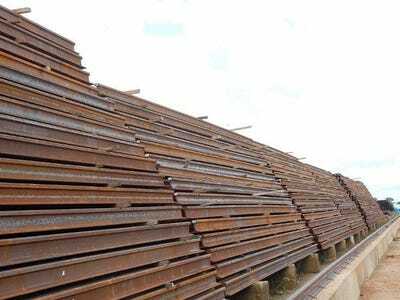 AFPCRCC says the Nigeria project will adopt Chinese technological standards and lead to $US4 billion-worth of Chinese exports of construction machinery, trains, steel products and other equipment, Xinhua reports. Beijing (AFP) – A state-owned Chinese company has signed a $US12 billion agreement to build a railway along Nigeria’s coast that it billed as China’s single largest overseas contract, state media said Thursday. China Railway Construction Corp. Ltd. (CRCC) signed the official construction contract with the Nigerian government on Wednesday in Abuja, the Xinhua news agency said. The Nigerian railway will stretch for 1,402 kilometres (871 miles) along the coast, linking Lagos, the financial capital of Africa’s largest economy and leading oil producer, and Calabar in the east, according to the report. The $US11.97 billion deal marks China’s largest single overseas contract project so far, it said, citing CRCC. The news came two weeks after Mexico cancelled a $US3.75 billion bullet train deal only days after it was signed with a Chinese-led consortium headed by CRCC — the sole bidder — reportedly due to concerns about transparency. CRCC chairman Meng Fengchao said the Nigeria project will adopt Chinese technological standards and lead to $US4 billion-worth of Chinese exports of construction machinery, trains, steel products and other equipment, Xinhua said. It will create up to 200,000 local jobs during the construction and a further 30,000 positions once the line is operational, he said. “It is a mutually beneficial project,” Meng was quoted by Xinhua as saying. Trains will travel at a maximum speed of 120 kilometres per hour on the link, the report added. China has dramatically stepped up its presence on the African continent in recent decades as it seeks more resources and new markets for its economy. Trade between China and Nigeria totalled $US13.6 billion last year. Chinese Premier Li Keqiang promised more investment and more Chinese technical expertise during a visit earlier this year.